In today's 360°, we explore a home that you probably dreamt about (or drew in your doodle book!) when you, well, started dreaming about your ideal home. It's essentially the adult version of a treehouse, except that this stands on firm ground! 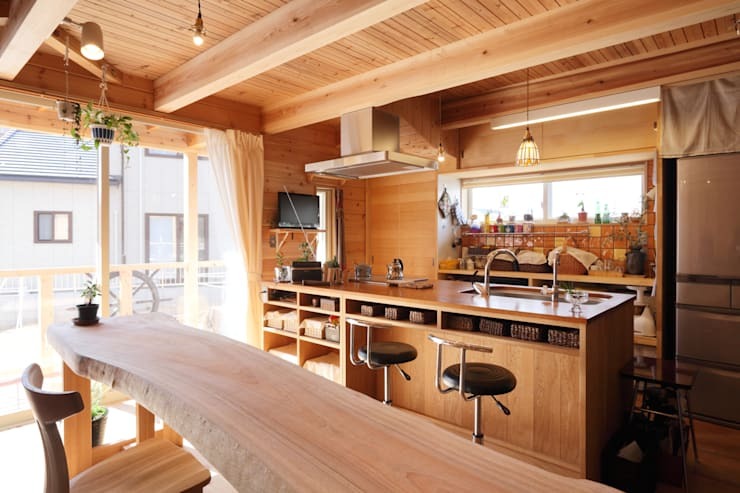 Architects Atelier Tama have managed to infuse an inherent playfulness to the entire space, making it a bright and cheery home that is perfect for a family. You don't set out to construct a grown-up treehouse and use any other material but wood. 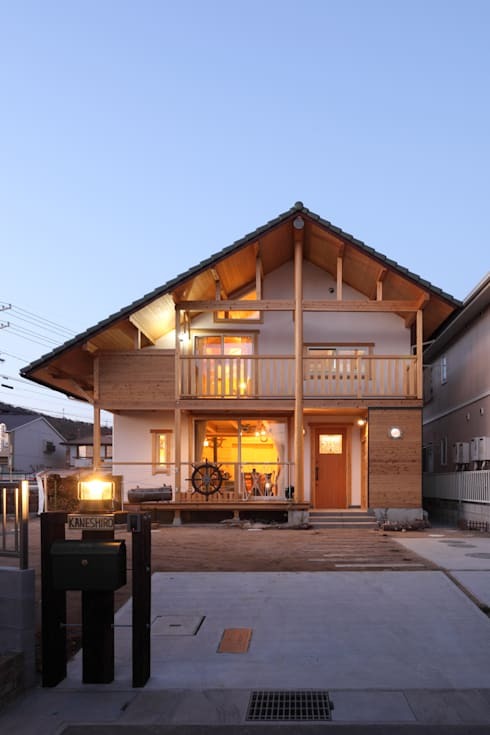 And so, this charming Japanese country-style home is decked out in wood from top to bottom, and where wood had to be sidelined in favour of more functional materials (specific to certain areas), the warm colour scheme is maintained. This is a home that is certain to fire up your imagination. Someone put this on the cover of a children's book already! Place this house in any neighbourhood in the world, and you're still going to do a double take. This rather mesmerising facade largely uses wood as its primary material immediately giving it a warm and inviting appeal. There are two levels here, with the top floor housing the bedrooms of both the parents and the children. Equal importance was given to both the interiors as well as the exteriors, as far as open spaces were concerned. While the house itself has large balconies and a porch, the front yard has also been kept open and spacious. Little details such as the vintage post box and the nautical wheel add a lightweight, playful feel to the space. Where do we even start with this gorgeous kitchen? We love this re-envisioning of a country kitchen; usually, there's a touch of rustic quality to country kitchens that is characterised by the extensive use of white (with a hint of bold colours and a rather flexible, eclectic approach to the decor. Here, the architects have opted for a slightly Asian-inspired version of a country kitchen. Wood, of course, dominates the decor scheme but instead of the customary minimalism of Japanese decor, you find grander touches. For example, instead of hiding them away, kitchen items are visually incorporated into the design with plenty of open shelving. Could we adopt this house (and that dog!) already! 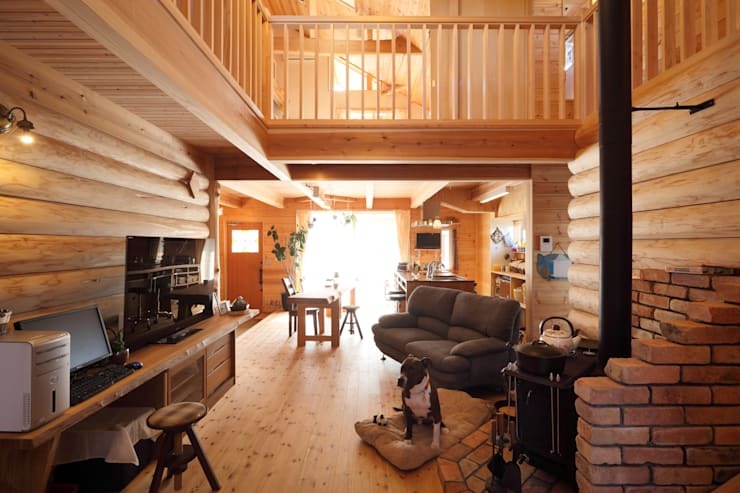 This gorgeous living room is an extension of the kitchen, and as such follows the same decor scheme only to give it even more of a wooden cabin feel. This is largely achieved by the timber logs that are used in place of standard walls and the half-complete brick wall that serves as the fireplace corner. By opting for a double-height ceiling, the architects have also managed to create a space that is airy and free-flowing. 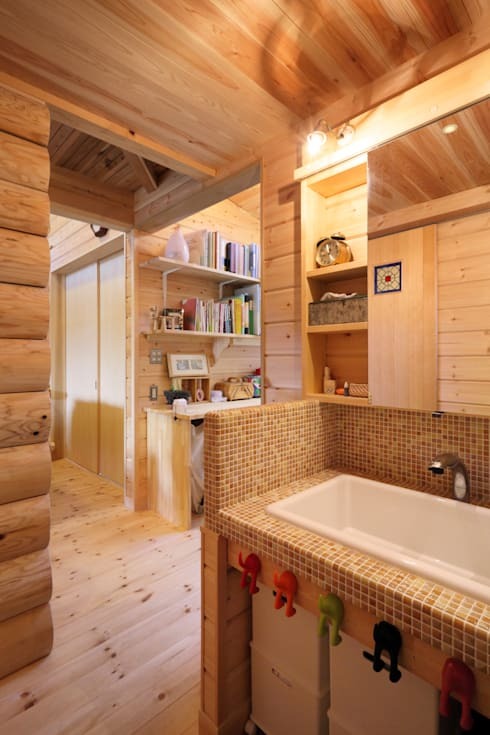 The bathroom is rather spacious and made even more so by the use of warm colours and abundant lighting. This inherently simple space is spruced up with a few details such as the tiles around the sink space and the little decorative elements. The area under the sink space as well as the cabinets above it are utilised as storage space. If this cosy bathroom has caught your fancy, speak to our experts who can help you recreate a similar style. Can one be legitimately jealous of a child? Alright, we kid, but this nursery is every child's dream come true. 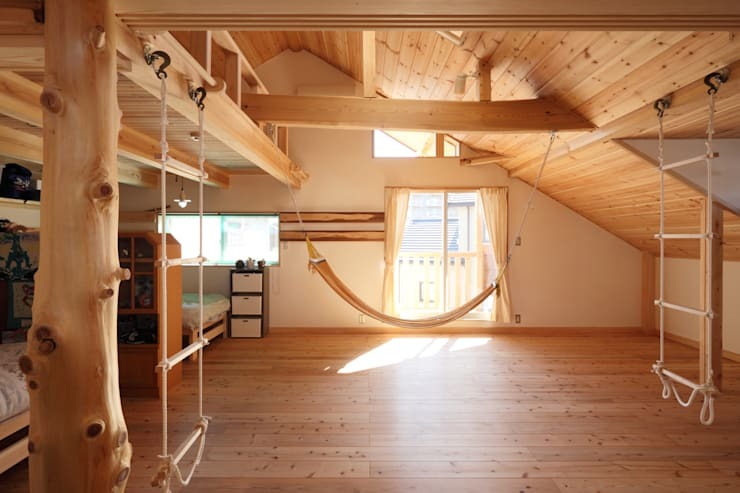 Designed almost entirely with wood, this space under the roof has essentially been cleared out to make space for that hammock in the centre! The uneven slant of the roof (seen in the first image) allowed the architects to place the children's beds on one side while keeping the other side freed up for fun and games. Those rope ladders only add to the charm! The space under the roof can be dark and so adequate lighting is key; here, there are plenty of windows and even a balcony that opens out onto the terrace. To see an altogether different Asian-inspired home, check out A classic Asian-style family home. What did you think of this inspiring country home?